Moto Retro Leuven a one-day old motorbike jumble ! Moto Retro Leuven is a one-day jumble with emphasis on sales and exchange by non-professionals. 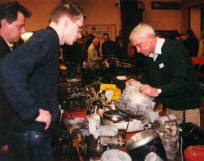 You still have an old engine lying around? Some old carburators? A couple of unique rocker arms? Boxes full of motorbike magazines... Don't worry. You'll be able to get rid of them, and for cash at Moto Retro Leuven. Exhibit stand for non-professionals ! On Sunday, 20st of October 2019. Set up your stand at dawn and in the evening you can already pack and go home again. It's the magic formula of Moto Retro Leuven. A market place for professionals as well as non-professionals. The visitors can only benefit from this formula. Moto Retro Leuven starts at 9, and the Brabanthal closes at 17 hrs. Children upto 12 years get in for free. Are you older? Pay less, buy using the reduction voucher. How do I get to the Brabanthal? The Brabanthal in Leuven is close to the center of Leuven. Only 4 kms to the south-east of Leuven, and 1 km from the E40 highway. Take exit n° 23 Haasrode-Heverlee. It's possible.... Do not wait to apply. The stands are limited. Early subscribers get the best spaces.